A backup entourage consisting of piano, standup bass, drums and guitar took their places first without ceremony. There was to be a polite patience until a still-glamorous Megan Hilty emerged to take on Port Washington for the first time since her 2013 appearance (our 2013 Patch review). At Landmark last weekend, Ms. Hilty @MeganHilty was true to form as a blonde in a black dress and serious heels. But she was also a little less bombshell and a little more like a cousin of a young Peggy Lee. Hilty started her first – and only – set with the classic “Come Rain or Come Shine.” Often heard in a mournful dialect joined with a slow to moderate tempo, Hilty’s take was downright jaunty and up-tempo. Come on rain, and come on shine; ain’t gonna un-sparkle her spirit. Then, recalling a recent Paris “BabyMoon”” (check it out, it’s even on WebMD), she crafted a version of Cole Porter’s “C’est magnifique” and the same composer’s “I Love Paris.” Here too the interpretation was decidedly upbeat. Carrying the beat in that small entourage was her husband Brian Gallagher, who was also present for the 2013 performance, Dennis Michael Keefe on standup bass, Matt Cusson @MattCusson on piano, and Ryan “Hoagy” Hoagland @Hoagy on drums. The TV show Smash was nearly omnipresent. Her performance of “Mr. 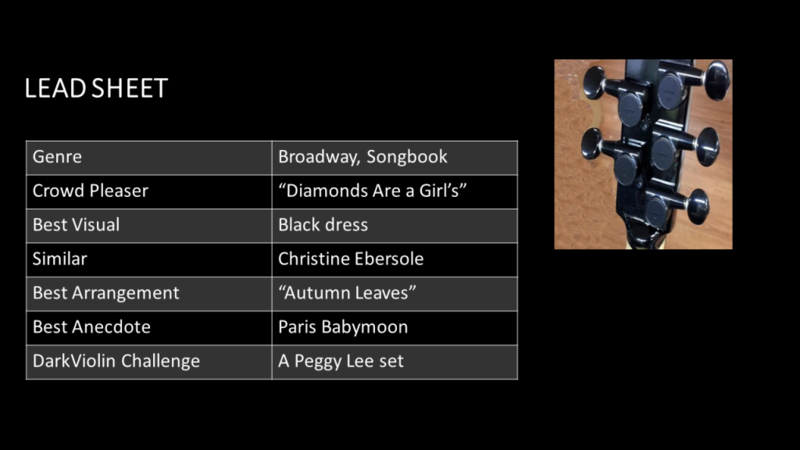 and Mrs. Smith” was part of Hilty’s planned June show featuring tunes from the show. The song’s line “We’ll move to Main Street USA” was tailor-made for this venue’s name and address. When she eased her way into “Almost Like Being in Love,” Hilty’s bounty of stage ease became clear. She showed about as much stage fright as a piano tuner facing a piano. Did this ease make for a better performance? Whatever singer’s edge might be dulled by it was offset by this singer’s spot-on intonation. It was to be a Hilty trademark for the evening. Hilty selected “A Place Called Home” to signal what had changed since her last visit. This down-tempo arrangement featured a perfect-mellow bowed bass part by Keefe, but she resumed the evening’s upward pace with “Come On, Get Happy” and Cole Porter’s “Let’s Misbehave” — though it was perhaps less clear how the latter fit into the “happy home” theme. Part of what Hilty called her “symphony work” included a thoughtful pairing of the classic “Autumn Leaves,” which featured the evening’s strongest use of dynamics, and Johnny Mercer’s “When October Goes.” This was easily the evening’s most musical arrangement. Hilty held a steady emotional intensity throughout the medley despite its insistent dips into melancholy. Just how good is Queen Hilty? As the final Smash song explained, “They Just Keep Moving the Line.” Look out, Ute Lemper. Somewhere around this time, Hilty made an intentionally half-hearted pre-encore exit. There was to be no wasted protocol; hers was to be a fast-paced show with minimal chitchat. After a speedy return, she sang a dynamic version of “Diamonds are a Girl’s Best Friend,” ending with a signature left hand salute. It was as if the Landmark audience had been waiting in a Times Square ticket line for hours to hear it. They loved the song, and Ms. Hilty rewarded them with extra helpings of verse. She closed the show with a heartfelt rendering of the Bing Crosby classic, “Count Your Blessings,” which she and Mr. Gallagher dedicated to their not-yet-year-old daughter Viola. Hilty could not possibly have been referring to this audience. Bet your Gershwin jammies on it. On May 27, humorist Spatz Donovan performs in a complimentary event, followed by folksinger Suzanne Vega on May 31.